Many people have been asking me what is happening with the KL Tower BASE Jumping event. As far as I am aware it appears I have been dismissed from my longstanding position of organising the event. The last time that this happened was 10 years ago. I am still organising Sibu BASE Jump 2018 though. Soon after the first time that I was stood down from organising the KL Tower BASE Jumping event back in 2008, the CEO at that time was heard telling his staff that he wished he had listened to me and taken my advice when they started having issues. But that did not stop KL Tower Management continuing down a very dark path in organising BASE jumping events. As they became more desperate they would eliminate all event safety precautions and standards. The following year I gave KL Tower managers very strong warnings that if they continued to attempt to organise BASE jumping events in such a reckless manner, then a fatality would most certainly occur. The KL Tower managers ignored all warnings and insisted on continuing with their reckless approach due to extreme naïvety, pride, and visions of grandeur. Very tragically, a fatality did occur on the first day of their very next event at Alor Setar Tower in 2010. This happened in full view of a crowd of spectators, including small children. With the trauma of being only about 10 meters from the high speed impact when it happened, and watching a few more near deaths a week later at the KL Tower event after KL Tower event managers continued to ignore more warnings that were sent from around the world, I vowed to never let ignorant and carefree managers of KL Tower be so irresponsible in their organising of BASE jumping events again. I think the majority of experienced BASE jumpers at that time knew that KL Tower managers would not comprehend their level of recklessness until someone died at one of their events. After this incident, I was brought back in 2011 to reinstate acceptable standards and organise the KL Tower BASE jumping event in a much more responsible manner. However, it always remained an uphill battle to try to educate KL Tower Managers and suppress their constant requests for “more” of everything that would only create more accidents and carnage. The same problems would be repeated every time a new manager was employed at KL Tower. 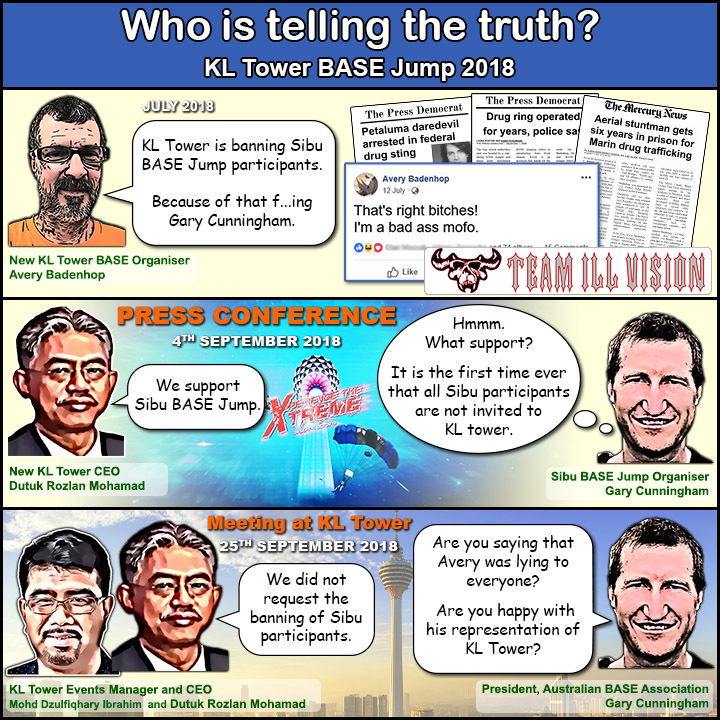 It seems a decision was made by new KL Tower Management to again discontinue my involvement in future KL Tower BASE jumping events a few weeks before the 2017 event. It was the most difficult lead up to the event, with mostly new event organisers and new event personnel that needed to be heavily educated about the special requirements of BASE jumping, and about all the past event issues that needed to be overcome. The relatively new KL Tower Events Manager showed great naivety, dictating policies that were just not acceptable for any BASE jumping event. At that time a third party person was sent to inform me that I was not welcome to speak to KL Tower Management anymore, and that I should not visit KL Tower before the event. This head in the sand approach is no way to organise a high risk BASE jumping event that is always full of potential issues and concerns. I could only assume it was due to two issues. The first issue was my insistence to provide a volunteer launch point and landing area safety crew that could uphold a minimum expected level of safety at the event. I had strong objections to the local so-called “safety crew” supplied for previous events that had become increasingly unacceptable every year, and were in no way suitable for the event. A new crew would turn up at the start of the event every year with no knowledge, skills, or training, despite great efforts to change this. They always encouraged safety breaches that would lead to a high number of incidents and people getting hurt at the event. They had no capabilities to relay safety information that would help prevent the many incidents that happen every year. This local event safety crew always stated themselves that they were not there to provide any level of safety for the event as they had zero knowledge. So it raises the question of why there was an insistence to pay these people to be there to increase the dangers of an already very dangerous activity. No professional BASE jumping event organiser could continue to allow a BASE jumping event to be run in such a manner that had a reckless disregard for participant safety. The local landing area crew supplied in 2016 in particular, reached a new low. The volunteer safety crew I insisted on using in 2017 was made up of BASE jumpers and some of their very knowledgeable family and friends that they brought to the event. They made a significant difference to the smooth and safe running of the event. It was interesting that it was the supplier of the substandard local safety crew that was sent to deliver the message that I would not be welcome at KL Tower anymore. The second issue was that I opposed KL Tower’s force marketing tactics targeting participant's families and personal crew that imposed high costs and forced unwanted purchases. It was well outside how a normal visitor to KL Tower was treated, and I saw it as a form of extortion. It led many event participants to keep their families away from KL Tower or not bring them to Malaysia at all. When international BASE jumpers were coming from around the world to promote KL Tower to the world as an awesome "must visit" place, it was very perplexing to see the relatively new KL Tower Events Manager insisting on promoting KL Tower to international BASE jumpers as a place of extortion and a place for them not to bring their families. KL Tower had certainly lost its welcoming feeling where visitors were once well looked after and fairly treated. In my 17 year history with KL Tower I had never seen a KL Tower Manager that was employed to promote the venue, create such poorly thought out policies that would only drive people away and degrade the image of KL Tower. This second issue also seemed to be tied to the first issue, as Tower Management appeared to be more focused on extorting my volunteer workers, rather than allowing them to provide an expected minimum level of safety at the event. While most event participants believe that they can jump flawlessly without incident at the event, every year up to 50% of participants soon find out differently in the KL Tower event environment. No one wants to see anyone get hurt. There is no excuse for not providing a maximum level of safety precautions for known potential issues, particularly in the area of frontline safety at the launch points and in the landing areas. To go into more detail about these two issues, I will first start with KL Tower’s force marketing tactics. KL Tower started their force marketing tactics in 2016. Participant’s partners, children over 13, packers, and other personal crew would no longer be permitted to be with participants in the tower head level TH03, where participants spend most of their time, unless they made an inflated forced payment for essentially 4 days of KL Tower’s "Sitting on the Edge" activity on level TH05, and 4 days of food. It was regardless of if they wanted these things or not, and regardless of if they wanted to hang around KL Tower for only 1 day or the entire 4 days of the event. Everyone begrudgingly went along with it to help KL Tower out during their financially difficult times. However, it proved to be very unacceptable for many, and it was certainly very out of line with the way other visitors to KL Tower were treated. It is immoral to try to force anyone, let alone a 13 year old child to sit on the edge of an exposed 300 meter drop (or force them to pay for 4 days of this) if they do not desire to do that. KL Tower’s introduction of the forced purchase of food for participant’s families and personal crew turned out to be a disaster for the event, with most participants and their families getting a bad case of food poisoning from the food that KL Tower supplied. Many had their holiday destroyed, spending half of the event sick in bed with constant vomiting and/or diarrhoea. It left them in a bad state for the remainder of their Malaysian holiday. I had never been so sick in my previous 16 years of travelling to Malaysia. Food poisoning mixed with BASE jumping was a dangerous combination. As the food poisoning took hold it quite probably was a factor in the increased number of people crashing in all over the place, and at least one very experienced BASE jumper losing focus and forgetting to secure on his safety equipment. KL Tower managers had insisted they must impose the forced purchase of food at the event for participant’s families to supposedly “enhance the experience for participant’s partners at KL Tower”, but it certainly resulted in the opposite. KL Tower Management gave no apologies, refunds, or other good will gestures to win back BASE jumpers and their families. In other countries they would have been prosecuted for food safety violations. For the 2017 event the KL Tower Events Manager insisted on continuing his unacceptable force marketing tactics, not willing to make any concessions for the unfair way that participant’s families and personal crew were treated, or offer them fair prices for the access they require. A participant's partner with three children was expected to pay US$900, even if they were only interested in spending time with their family member in the tower head level TH03 for 1 day, and were not interested in the “Sitting on the edge” activity on level TH05. In comparison any normal spectator could pay an early bird price of US$32 for access to the "Sitting On the Edge" activity which also included access to the Sky Deck and the Observation level, and a T-shirt. After failing to receive any response from my query on fair pricing for partners, children and packers that only required access to level TH03, to get a clear perception I actually ended up asking the KL Tower Event Managers if it was their intention to use participant’s partners and children’s desire to be with their family member at level TH03 to extort them to pay high prices for other things that many did not need and want. When I finally got KL Tower managers to at least offer daily prices of their complete package, so BASE jumpers could afford to have their family members they brought to Malaysia with them at KL Tower for at least part of the event, the prices were further inflated with KL Tower managers admitting it was inflated to try to “force” everyone to pay for 4 days. It became quite clear that the new KL Tower Management only looked upon BASE jumpers families and children as a high dollar target that they thought they could extort well beyond the normal visitor. This was not the KL Tower that I had known for the first 15 years of the event that previously had a welcoming atmosphere and mostly treated everyone fairly. As a further insult to participant’s families and personal crew, the complementary access they had for the first 15 years of the event which was taken away from them in 2016, was now being given away to 90 random spectators in the form of a competition. BASE jumpers were already paying KL Tower a high fee for the privilege of performing in front of KL Tower’s visitors and promoting KL Tower to the world. They are risking the lives and well being to do so. When doing this they do not expect the unscrupulous extortion of their family members and personal crew. KL Tower managers did not like it when it was turned around on them. They were reminded that other countries actually pay BASE jumpers to perform displays. If KL Tower managers insisted on extortion of participant’s families and personal crew, then BASE jumpers would impose a professional display fee on KL Tower if they wanted any display jumps. Normally BASE jumpers would go out of their way to help KL Tower, as I have done for 17 years, but not if they are going to treat BASE jumping, BASE jumpers, and their families with a high degree of disrespect. While the relatively new KL Tower Events Manager was uncompromising and banned me from any further contact, an appeal to the CEO a week before the event left the CEO deciding not to promote KL Tower as a place of extortion and a place for participants not to bring their families. However, it was too late for those that decided not to come to the event, or to leave their families at home. As I warned KL Tower Managers from the start, their force marketing extortion tactics would not maximise their profits. It would only be successful in driving many people away, minimise their profits, and create a bad image and disrespect for KL Tower. I will now move on to more details about what I see as a neglect of participant’s safety. With a large number of preventable accidents happening every year, attempts to enhance event safety precautions to a more acceptable level was always sabotaged with the insistence of KL Tower Management to supply launch point and landing area crew every year that had no knowledge, skills, or training. It is uncertain if this was due to extreme ignorance with KL Tower Management forgetting or ignoring many harsh and tragic lessons of the past, or if there was something much more sinister going on with KL Tower Management insisting on setting up the event in a dangerous manner that always increased the number of people who get hurt. The prime focus for any event of this nature should be to achieve zero incidents, not to try to maximise the number of incidents. Launch point and landing area safety crew are expected to do simple tasks such as air traffic control, ensure participant’s safety gear is secured, prevent participants from jumping in any head winds which always eventually results in someone hitting the tower every year, ensure wind indicators are placed in the landing areas, radio up information about rapidly changing wind conditions in the landing area and about recent incidents, keeping participants that are about to jump well informed of changing wind conditions and recent incidents caused by changing winds, and educating participants about any safety breaches they have observed. These are relatively easy tasks for anyone with BASE jumping knowledge and good communication skills. Done properly, helping participants to make much more informed decisions, and stopping them from committing various safety breaches, goes a long way to preventing the large number of incidents that happen in the KL Tower event environment every year. This is the absolute minimum I expect for an acceptable level of safety at the event, along with thorough applicant screening, and detailed participant education of all the incidents and mistakes we have seen in the 17 year history of the event. I started making efforts in 2014 to try to stamp out the practice of providing unacceptable launch point and landing area safety crew. With KL Tower Management’s insistence to channel event funds to people with no capabilities, the best and only option to get the most capable crew was to use volunteers in the form of knowledgeable family and friends that participants already bring to the event with them. Many of these people have high knowledge and capabilities to actually be an asset to safety at the event and help reduce the number of incidents that occur, compared with the local hired crew that are always a safety liability. In 2015 KL Tower managers rejected the use of capable launch point and landing area safety crew. They again insisted on hiring unacceptable local crew that would have no knowledge, skills or training, and would again degrade the safety of the event to an unacceptable level and be a factor in serious accidents. The head of the safety crew declined written safety guidelines that I had prepared for the safety crew, and had stated during the event that participates were free to breach safety guidelines, such as not jumping into headwinds, if they choose to. After the launch point crew encouraged participants to blatantly jump into headwinds and it resulted in one participant slamming into KL Tower and then getting knocked out unconscious when he crashed onto the ground floor rooftop, I became more determined to stamp out the use of unacceptable safety crew that had no place being there. We have seen even more severe accidents from the same thing in past years. BASE jumpers should know better themselves not to jump into head winds as they are briefed about it every year, but it is certainly far worse when the launch point crew are encouraging participants to do it. When the 2016 event came around, KL Tower Management again tried to reject, and then severely restricted the capable volunteers I had lined up. I was given what all event personnel knew were false assurances that local crew with zero knowledge would create no safety breaches. In response to problems with the safety crew in the previous year, I had already modified the safety briefings to tell event participants not to follow any dangerous instructions given by the “so called” safety crew. This is the year I first met the new KL Tower Events Manager Mohd Dzulfiqhary Bin Ibrahim. After informing him that the event was set up in a very negligent way, he appeared very dismissive of it. I was surprised that he appeared to have no interest in what was a potential liability for his company, and the safety of visitors to his tower. It was an instant red flag within 5 minutes of meeting him that he did not seem suitable to manage BASE jumping events. The 2016 event started in chaos when the local landing area crew failed or refused to put up any wind indicators. After receiving radio clearance that everyone was set up in the landing areas, we decided to start jumping at the event before wind indicators were put up, as the wind direction seemed very obvious. I also expected that it would not take very long for the landing area crew to put up some wind indicators. But instantly people started crashing in with unseen and unexpected turbulent winds in the landing area in the morning. After failing to receive any radio response from constant requests to the landing area crew to put up wind indicators, we had to get a spectator who was a participant’s partner that paid a high fee to be there, to take a small flag that we had at the launch point down to put up as a basic wind indicator in the landing area. After the flag appeared to be of inadequate size to be clearly seen, I made further requests by radio asking the landing area crew to put up wind indicators that were more visible. The only radio response I eventually received was from the supplier of the landing area safety crew, saying that it was not their problem. So as soon as I could get my trainee volunteer the takeover at the launch point, I ended up hobbling down to the landing area, while still recovering from a back surgery at the time, to climb up some poles and put up wind indicators that were more visible myself. As I arrived in the landing area, very experienced jumpers were still crashing in everywhere with swirling winds. In hindsight I should have not allowed jumping to start until wind indicators were set up. We were given the excuse that landing area crew were unable to speak English, so they ignored all our calls to put up wind indicator streamers, and of course they were no use to be of any aid to the event in relaying up any safety information to the launch point. It continued to leave the question of what these people were actually being paid to do, and why KL Tower Management was so against having people there that could provide an adequate level of safety for the event. The following day when the landing area crew was replaced with people that supposedly could speak English, they would respond to all coordination calls that were between the different launch points. This blocked coordination between the different launch points, as the landing area crew radioed false clearances for people to jump. Sending false clearances to jump potentially leads to horrific canopy collisions of people from different launch points meeting up as they come in to land at the same time in narrow landing areas. With no crew in the landing area capable of relaying up safety information about changing winds or accidents caused by the changed wind, the same type of accident continued to happen one after another, after another, within minutes of each other. No warnings would be given to those who were about to jump about the issues people were having in the landing area with changing winds. There were also reports of the launch point crew telling participants that it was ok to jump into head winds due to them only being light. But has always been when people have jumped in light head winds that someone hits the tower every year. This is a small part of the chaos and problems the event endures with incapable launch point and landing area crew every year. It is no way to conduct a high risk BASE jumping event and I needed to stamp it out once and for all to help prevent many people getting hurt at the event. When the 2017 event came around, I trained a volunteer crew capable of upholding an acceptable level of event safety, and I was not taking no for an answer from KL Tower Management. The KL Tower Events Manager insisted they could not afford to have foreign crew at the event (my volunteer crew that were essentially free), and they could only afford to hire local event crew that we knew again would have no knowledge, skills, or training, and would be a safety liability at the event. The KL Tower Events Manager was essentially insisting to pay people to only pretend to look after participant safety and make the event much more dangerous. At the same time he was trying to stop much more cost effective and capable people from providing the minimum acceptable level of safety we expect at the event that would help to prevent many event participants from getting hurt. It is unknown if the KL Tower Events Manager just had extreme ignorance about his reckless disregard for participant safety, but it seemed more that his primary desire was to extort my volunteer crew and chose to be dismissive of participant safety while channelling event funds to various locals. There was an insistence that my trained volunteer safety crew actually pay KL Tower to be there to maintain an acceptable level of safety at the event, but I would in no way accept them trying to hold the safety of participants and the integrity of the event to ransom. The volunteer crew were already giving up a lot of their own time and money to be there to compensate for the KL Tower Events Manager’s negligence. The KL Tower Events Manager had also driven away other safety aspects of the event. It was his strange idea that he was “helping” highly experienced BASE jumper Christopher McDougal (Douggs) to come to the event and give his aerials safety seminar, by actually wanting to charge Douggs to do so. The event has been very fortunate in the past that Douggs has always generously given up his time to do it on a volunteer basis to enhance the safety of the event in an attempt to help keep everyone safe, and help everyone excel their skillset. On the first morning as the 2017 event started, some hired local crew turned up to the launch point saying they had been given no training and their only instructions was to turn up there. I informed them that I had my own trained and capable crew in place for the morning session of jumping, but they were welcome to hang around and learn what they need to do to become useful. They declined and that was the last I saw of them for the rest of the event. Another hired local crew member did not even bother showing up as he knew he could not do the simple task we wanted him to do. Although there was a shortfall of capable volunteers that I trained, they made a huge difference to the smooth and safe running of the event. They greatly contributed to preventing any tower strikes for the first time in the 17 year history of the event, and there was also a significant decrease in the number of other incidents. Providing a substandard safety crew for a high risk BASE jumping event is in no way acceptable. As I explained to the KL Tower Events Manager, if you cannot afford to properly look after participant’s safety at the event, then you should not have an event of this high risk nature. BASE jumpers and their families have gone out of their way to try to provide this service for free, so there is no excuse to be so irresponsible and try to inhibit this. Even the most hard-line CEO that was brought in from 2010 to clean up the corruption within KL Tower and make it a profitable venue, had a good understanding and sense of responsibility when it comes to participant safety of this high risk activity. It was hard for her not to learn this when there was a fatality just two weeks into her appointment at KL Tower. Sadly the event and attitudes at KL Tower started to decay in 2015 after she moved on from KL Tower. The relatively new KL Tower Events Manager, Mohd Dzulfiqhary Bin Ibrahim, has stood out as having severe tunnel vision for his flawed theories of maximising profit, while totally disregarding is duty of care to maintain an acceptable level of safety for KL Tower event participants. His form of marketing and BASE jumping is a very dangerous mix, and they cannot co-exist for too long without tragedy. With the attitude he currently displays, I feel he has no place presiding over BASE jumping events, or any aviation sport or other high risk activity for that matter. He may see being responsible as a liability to his flawed theories of maximising profits, but being irresponsible with the very high risk activity of BASE jumping has a much greater cost. The reckless disregard for the safety and well-being of participants does not seem to be in line with the more responsible values that I have previously seen from KL Tower’s parent company Telekom Malaysia. The Risk Management team at Telekom Malaysia have been seen making wise decisions in the past which are in line with the required level of caution that BASE jumping demands. They have been very conscious of their image if things go bad. If they have no awareness of the irresponsible way the current KL Tower management try to conduct high risk BASE jumping events, then they should investigate and not just take false assurances that everything is conducted to the highest standard, or even acceptable standards. I do not believe that the Risk Management team at Telekom Malaysia would be approving of current practices if they had a full understanding of them. When Telekom Malaysia assign new managers to KL Tower, they need to put in safeguards to ensure that the new managers have the right aptitude to manage high risk BASE jumping events. As far as I understand, KL Tower Events Manager Mohd Dzulfiqhary Bin Ibrahim has eliminated those with the most knowledge and experience from the event, so that he can continue with unacceptable practices. When the same thing happened several years ago, they were left with people that did not have the integrity, fortitude, or knowledge to stand up and say no when the line of gross negligence was crossed. Those that did have some knowledge still followed any orders of negligence, even when they knew that would promote serious injury or death at the event, due to fear of losing their job. The Malaysians charged with looking after event safety have long learnt the attitude from KL Tower Management that “Nobody cares, so why should I”. I have no regrets standing up for BASE jumpers or their families. I have no regrets trying to uphold the integrity of BASE jumping events and to try to protect the image of KL Tower. The only thing I do regret is not shutting down KL Tower’s events in 2010 when it became very obvious that their previous form of gross negligence would soon bring a death to their event. I think that my 17 year history and dedication with the event, and the fact that I have done more building display jumps than anyone else in the world speaks for itself. I have seen all the mistakes repeated at events over so many years, and I have logged and analysed all the incidents and horrific accidents. With my unmatched knowledge and experience with building events throughout Malaysia, I feel I have a good sense of what it takes to create an acceptable BASE jumping event at KL Tower, and what is not acceptable. BASE jumpers have really enjoyed their visits to KL Tower and Malaysia for most of the previous 17 years. They would love for BASE jumping events there to continue well into the future. But they do expect them to be organised with a reasonable level of responsibility and safety. They also do not expect their families to be extorted well beyond that of a normal visitor when they are coming to promote KL Tower and Malaysia to the world as the awesome “must visit” place it had previously been for many years. If this is the end of my 17 year involvement with the event, then I would like to give extra praise and recognition to the Bomba Rescue Team that have greatly supported the event over the years. They had a huge step up in response in 2013 that was triggered by a severe accident in 2012. A BASE jumper had hit KL Tower and was knocked out and lying unconscious on the catwalk of level T02 near the base of KL Tower with broken bones throughout his body and heavily bleeding out of compound fractures. Bumbling KL Tower staff greatly delayed Bombas response to get to the severely injured person by about half an hour, taking them to the wrong levels. We all greatly failed that day having complacency that KL Tower staff could quickly guide Bomba Rescue to the catwalk on level T02, which should have taken less than a minute. After 20 minutes of the injured person lying there, a horrified South African BASE jumper took it upon himself to find a route up to attend to the injured jumper. He arrived well before Bomba rescue finally found a way out to that level. The response from Bomba Rescue the following year in 2013 was tremendous, conducting training at KL Tower with all their rescue appliances and getting to know every part of KL Tower so they would not have to rely on KL Tower staff who always seem to get things wrong. I have since seen 2 rescues with BASE jumpers crashing into the ground floor roof with Bomba getting to the injured BASE jumper in just 4 and 5 seconds. They come very prepared and are truly professional in what they do. Having an ever improving rescue team is no excuse for KL Tower managers to be grossly negligent in the area of accident prevention. Trying to hold our safety to ransom is immoral and in no way acceptable. You may have been successful in eliminating the most knowledgeable and experienced building jumper / BASE organiser with 17 years experience at the event. But taking away an unmatched level of experience and knowledge from the event is not going to help you. BASE jumpers will no longer tolerate your extortion of their families and personal crew. They may tolerate your reckless disregard for their safety for a short while, as most of them are certain that they can jump flawlessly at such an event without incident. However every year up to 50% soon find out differently in that type of event environment. No one wants to see anyone get hurt, and there is no excuse for not providing a maximum level of safety precautions. If you want BASE jumping events at KL Tower then you must always treat BASE jumping with the high level of respect that it always demands. It is a very different activity than taking people for a ride in your elevator, and it has very serious consequences if you get complacent or loose respect. Treat the people who are risking their lives and well being to promote KL Tower to the world, and their families, in the same manner that you would like KL Tower to be presented to the world. KL Tower is an icon of Malaysia so your attitude represents the perception of your whole country. I really hope that you learn to be responsible before you spill other people’s blood all over your tower. Please bring back the welcoming feeling at KL Tower where all visitors feel very welcome and well looked after. Make it into the awesome “must visit” place it once was, instead of turning it into a tourist trap that everyone wants to avoid. Note: All dates are preliminary. They are based on being a week before the dates we assume KL Tower may take place. If KL Tower BASE Jump 2018 is announced to take place on dates different to what we expect then the date of Sibu BASE jump 2018 will be adjusted be be a week before KL Tower Jump. BASE jumping will be off Wisma Sanyan on the island of Borneo in Sibu, Sarawak, East Malaysia. Standing 126 meters high Wisma Sanyan is the tallest building in East Malaysia. The welcoming atmosphere and hospitality in Sibu is the best we have experienced in Malaysia. The management of Gua Damai Extreme Park will open up their small cliff for BASE jumping during the days of Tuesday 25th and Wednesday 26th September. This is a popular cliff that many participants like to jump off before the main event at KL Tower. Gua Damai is about a 20 minute drive north of KL Tower. KL Tower BASE Jump 2017 took place from 29th September to 2nd October over 4 days and 2 nights. 3067 BASE jumps were completed by 102 BASE jumpers from 22 countries during the 4 day event. Participants were from Australia, Austria, Belgium, Brazil, Canada, Finland, France, Germany, Ireland, Italy, Japan, Luxembourg, Malaysia, Netherlands, New Zealand, Norway, Poland, Protugal, Russia, Switzerland, United Kingdom, and United States. Sibu BASE Jump 2017 took place from 21st to 24th September off Wisma Sanyan. Standing 126 meters high Wisma Sanyan is the tallest building in East Malaysia. 84 BASE jumpers from 17 countries completed a record 2032 jumps at the event. Participants were from Australia, Belgium, Brazil, Canada, Finland, France, Germany, Ireland, Italy, Malaysia, Netherlands, New Zealand, Poland, Protugal, Russia, United Kingdom, and United States. The management of Gua Damai Extreme Park opened up their small cliff for BASE jumping during the days of Tuesday 26th and Wednesday 27th September. This is a popular cliff that many participants like to jump off before the main event at KL Tower.